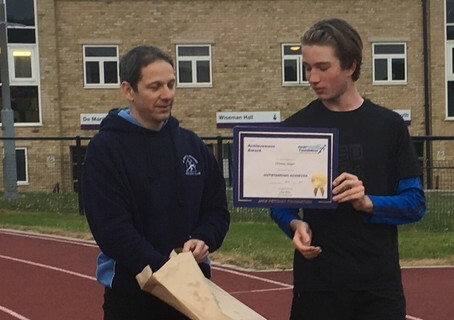 St Marys Richmond Athletics Club are proud to be part of the Jack Petchey Achievement Award Scheme which allows us to recognize the achievements of three young athletes (aged between 11-25) each year. Awards can be given for commitment, supporting others and achieving personal goals. Our latest award was presented to Ollie (pictured below) for his volunteer work with the Junior section. Congratulations to our Spring/Summer winners who were presented with their awards in June 2018. Arthur was nominated for engaging and participating fully in SMRAC life while not letting his visual impairment inhibit him. Nina was nominated for an achievement award in recognition of her volunteer work with the junior section, her encouragement and positive attitude towards other athletes and her commitment towards her training. Our Autumn winners were presented with their awards in October 2017. Isabel's award is in recognition of her volunteer work with the juniors on a Tuesday. She also has a positive attitude to her own sprints training. 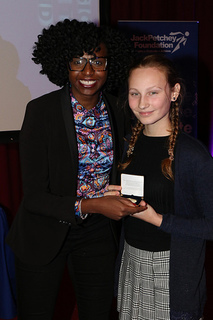 Isabel was presented with her award by Olympian Donna Fraser at the Jack Petchey Celebration Event in December. Ross won his award for persevering with his athletics training despite some health challenges. In 2017 Ross represented SMRAC in both cross country and on the track, running the fastest time of any SMRAC member in 800m and 3000m. 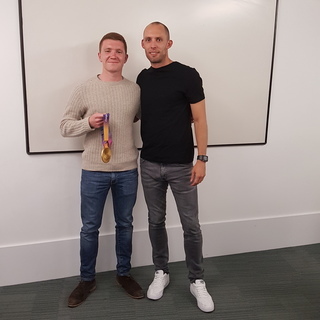 Ross used his Jack Petchey grant to arrange an inspirational talk to club members by Dai Greene (Wales & GB hurdles), pictured below. Congratulations to Eleanor and Thomas. Eleanor won the award for representing the club, always being pleasant around the track and taking responsibility for others when it is not her duty to do so. Thomas is a popular and valuable member of the team who has helped with warm ups and is thriving at SMRAC. Our Autumn Winners were presented with their awards in November 2016. Congratulations to Imogen and Mattie. Imogen was nominated for training hard, regularly representing the club and her friendly and supportive attitude towards new juniors joining the club. Mattie, a two-time nominee, won for his outstanding contributions in shot and discus, his hard and dedicated training and being a good group player willing to give advice to new throwers. In addition, this year, Kim Weir, the indefatigable Chairperson of SMRAC, deservedly won the vote for the Jack Petchey Foundation Leader Award. Kim, several of the Achievement Award Winners (Mattie, Imogen, Kya, Josh), and their families, attended the Jack Petchey celebration event in Wandsworth in early December 2016 to receive their medallions from Donna Fraser (400m GB Sprinter). The event was attended by over twenty other youth organisations celebrating the hard work and achievements of their young people and leaders. Alfie has started to volunteer with the coaching of the Juniors two times per week alongside doing his own training. He has been setting a great example for all the younger members of the club. Josh was nominated twice in this award period and won for all the SMRAC XC assistance he gives to both the team manager and younger athletes. Katie has been volunteering for the Minis for over a year now, after only needing to do it for three months for her DofE. She’s loved it so much she’s kept on volunteering, and persuaded her sister to do the same. Kya was nominated for always challenging herself, always pushing through to put aside her autism. Issy was given her award for always pushing herself to achieve in her running and always being willing to help both the coaches and her peers. They were presented with their certificate and badges at training sessions in May. Iain for helping less experienced athletes with developing their hammer throwing skills and for his willingness to support the coaches. Nick’s was for helping new athletes in the springs group. As well as working hard on his training and competing he has enjoyed coaching that he has now completed the Athletics Leader course to develop his coaching assistance skills. Cecilia was given her award for consistently working hard and overcoming obstacles to reach her goals. Congratulations to Harriet and Imogen who were our first Jack Petchey award winners. They were presented with their certificates, badges and notes from Jack Petchey at their training session in April. 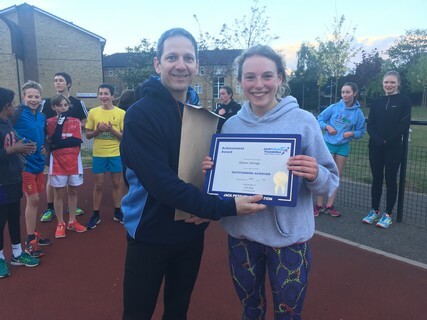 Harriet was nominated by three different people and won her award not only for her own progress and performance but also for her dedication to coaching and officiating. Harriet gives up a lot of her time to support others at the club and she is an indispensable asset to the throws athletes. Imogen has been supporting another young athlete who has autism and benefits from having a running companion. Imogen has supported the young athlete at the junior sessions for the last 18 months and has now moved to the teenagers sprint group with the athlete even though her own preference is the longer distances. A great example of community spirit. Congratulations to Alice and Sean who received their Jack Petchey awards in June. Alice was nominated both for volunteering with the Minis on a Thursday evening where her support with our youngest athletes is invaluable and also for taking up a new event in the Pole Vault and training hard with great results when she won the event in the Southern Athletics League fixture with a new personal best. Sean won his award for always doing his best and never being afraid to ask questions. Sean has gained confidence in his own ability as he has seen his runs improve. Well done to Rebecca and Thea who received their awards in October. Thea received here award for volunteering every Thursday evening at the Minis session where she helps the under 11s with their training session. Rebecca has represented the club in many events over the last 6 years and is always willing to step in and help where needed. She is a level 2 coach and gives advice and support to other athletes and also helps at events with measuring and organising younger club members.